In stock -This product will ship today if ordered within the next 9 hours and 6 minutes. Natures Aid EchinEeze is a traditional herbal medicinal product used to relieve symptoms of the common cold and influenza type infections based on traditional use only. Calcium Hydrogen phosphate, microcrystalline cellulose, colloidal silica, crosscarmellose sodium and magnesium stearate (vegetable source). Adults, elderly and children over 12 years take 1 tablet 3 times a day, Start at the first signs of a common cold. 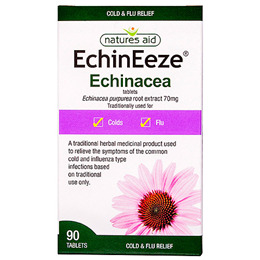 Below are reviews of Natures Aid EchinEeze - Echinacea - 90 Tablets by bodykind customers. If you have tried this product we'd love to hear what you think so please leave a review.